Last Saturday I was having a tranquil time, teaching watercolours to a group of beginners, with the sun shining in on the jug of tulips on the table, and some 1940's big band music on in the background... Couldn't have got much better, really. The postman arrived, and I opened some letters as I waited for everyone to finish an exercise in mixing colours. 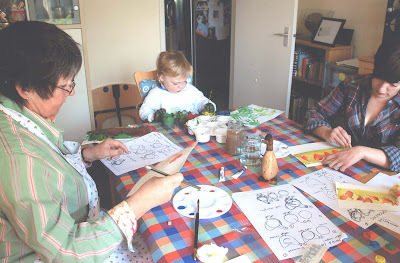 "My wife and daughter enjoyed the "Painting Chickens and Ducks Workshops" last Wednesday so much that that they decided to practise the following day. Of course Sarah's daughter wanted to join in as well, as you can see. But she has to learn that you have to paint on paper and not cover your hands in paint!" 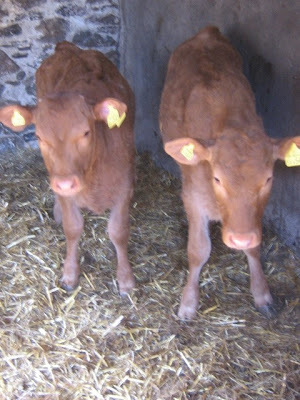 Well, on another subject entirely, I did promise ages ago, to show you the photo of the twin orphan calves at my friend Elizabeth's farm. Here they are, below. Aren't they beautiful? And they are doing a great job of looking after them down at the farm. I'm hoping to get over to Elizabeth again in the next few weeks and I'll take another photo of the twins as an update, to show you.
" I never thought I'd see the day..."
Nope, I never did think I'd see the day when I would bake an apple pie ( and make the pastry by hand!!) like this. Although I love the idea of baking, and have every kind of tin, biscuit cutter, piping bag and dish under the sun, the idea somehow rarely becomes a reality. The last time I made a chocolate cake it turned out like two oversized chocolate biscuits on top of each other, and I never remember to defrost the frozenm ready made pastry in time for an apple pie, so it always ends up as an apple crumble instead. But at the prospect of Nigel's venerable uncle and aunty coming down to stay from Tonbridge Wells, and in an uncharacteristic fit of bonhomie, I offered to cook Sunday lunch for all Nigel's family so they could all meet up with the long lost uncle again. I decided I'd better do something a bit more impressive than the usual crumble. Today is a nice calm day: the birds are singing, the sky is gloriously blue and sunny, my admin is finished for the day (phew,) I'm sitting here writing my blog and am just about to go out and plant some Sweet Peas and Ox Eye Daisies. Tomorrow, however, the forecast is rain and cold, and I'll be driving to the county of Somerset to take part in a "Women Do Business" Day workshop on "Exporting Abroad." I'll take a clipboard with me. It might make me look a bit more official. So you might be in for another lecture on The Nature of Modern Life, on your next visit. Some people are just Born To Make, aren't they? I think most of us bloggers are members of that group, don't you? 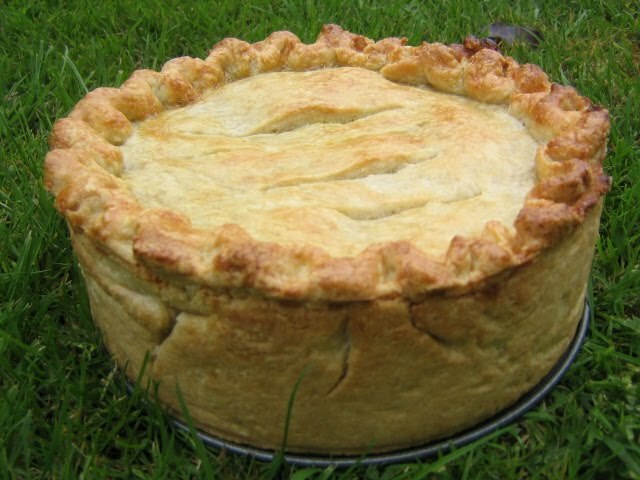 Ok, now I have to make an apple pie today as my mouth is watering at the sight of yours!